Freedom is the most important human right. Over the years, people of all nationalities, races and cultures have always migrated from oppressive regimes to countries where they enjoy greater freedom. The most liberal countries – like South Africa on the African continent – attract the most refugees. Liberty gives meaning to human existence; it is what we yearned for when we were under the yoke of apartheid. We sought true freedom; not only civil liberty but also economic liberty. The end of apartheid increased South Africa’s economic freedom and we moved up the Economic Freedom of the World Report rankings to 46th in the world in the year 2000. After 30 years of an economy that was shrinking at an average rate of one per cent per year, it started growing. This growth was to be expected, as the abolition of initiative-draining, racially-based laws was equivalent to feeding growth hormones to the economy. The barriers to advancement were suddenly lifted for South Africans of all races. We were finally free to do anything we liked. The days of entering through the backdoor and the ‘Slegs vir Blankes’ (whites only) signs could be forgotten. Besides the civil liberties that freed us from having to skulk around and constantly look over our shoulders, it was the increased economic freedom that spurred the economy. Forty-one million South Africans could now fill jobs previously reserved for only five million. The sky was the limit for every child born in our free country. Prosperity was within our grasp! How could we not prosper if everyone could finally put their talents to the best possible use? As we know in 2018, this has not happened. While the world in general, including some of the previously most-oppressed countries, is gaining in economic freedom, South Africa is bucking the trend and intentionally moving in the opposite direction. Our economic freedom ranking has declined from 46th in 2000, to 110th in 2018, and almost 40 per cent of the potential workforce is unemployed. How can the collectivists not know that when public enterprises run businesses, such as South African Airways and Eskom, it is bad for consumers and workers as taxpayers? Because state industries are incapable of competing in the market, their political nannies protect them; they prohibit private companies from competing with them, and constantly feed them with extra taxpayer cash when no economic justification exists for doing so. The result is high prices, poor service, excessive taxes, and constant anxiety for workers. Collectivists say state industries belong to the people, but they refuse to hand them over to these ‘owners’. The Free Market Foundation has long contended that giving ownership of public enterprises to the poorest people in the country would represent real empowerment. We suggested a ‘democracy dividend’ consisting of shares in the public enterprises, and more recently, transferring ownership of hospitals and clinics to the people who work in them, and where appropriate, to the surrounding communities. Utilising the vast assets accumulated by the pre-democracy governments to remedy past wrongs is the best way to empower, without harming the economy for decades to come. In the 2018 Economic Freedom of the World Annual Report, South Africa slipped back in the ranking to 110th. Twelve African countries are now above South Africa on the economic freedom rankings. They are Mauritius 8th, Rwanda 40th, Botswana 44th, Uganda 46th, The Gambia 49th, Kenya 61st, Seychelles 58th, Tanzania 79th, Cape Verde 93rd, Zambia 97th, Ghana 98th, Liberia 100th and Swaziland 108th. South Africans should be concerned about this slippage in our economic freedom ranking for two reasons. The first is that the measures of human welfare show that the citizens of economically freer countries are better off than those in less free countries. In freer economies, incomes are higher, economic growth is higher, more people are employed, life expectancy is greater, infant mortality is lower, there is less corruption, and the people have greater political rights and civil liberties. The second is that freer economies attract more investment capital, which is necessary to increase economic growth and improve the incomes of the poorest members of our society. Collectivist claims that the ‘working class’ is better off in command economies with high levels of government ownership and control of economic activity are wrong. The truth is just the opposite as the figures clearly show. Simply visit the top five free economies: Hong Kong, Singapore, New Zealand, Switzerland, and Ireland to understand why they are more desirable places to live and work in than the bottom five countries: Syria, Algeria, Argentina, Libya, and Venezuela. Argentina is the saddest example among the least free economies. In 1913 it had the 10th highest per capita income in the world, ahead of France, Germany and Italy. In the past 100 years it has been the victim of successive command economy governments following poor economic policies and its relative income per capita is less than half what it was in its golden days. An example not to be followed. Free economies do not come about by chance. They are the result of the conscious creation of an environment that is conducive to a high level of entrepreneurial activity and that has a minimum of bureaucratic red tape. 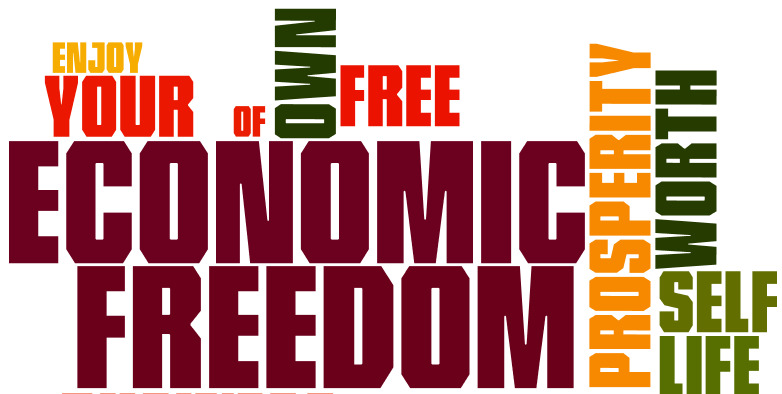 The key ingredients of economic freedom are: personal choice, voluntary exchange coordinated by markets, freedom to enter and compete in markets, and protection of persons and their property from aggression. Temba A Nolutshungu is a Director of the Free Market Foundation.